In the United States, there are 5 million annual concussions. Currently, the highest growth rate of these is in middle school aged children (ages 10-14). As Wellness Champions doctors, Drs. Jake and Jess have been working with doctors around the country alongside 20 year MLB pro player Matt Treanor and his wife, Misty May-Treanor on spreading knowledge about the seriousness of concussions. Professional athletes in all sports are walking away in their prime due to risk of concussion and cognitive deficits later in life. While it has been great working alongside both professional and college athletes, we are more concerned about the health of students and athletes in our community. In 2015, 18 high school athletes died due to concussion and second concussion syndrome in the United States. High school athletes are 2x as likely to be concussed than college athletes, and 1 in 5 of all high school athletes experience a concussion. 70% of these occur at practice where most organizations don’t have the means to staff medical personnel at all times, increasing the risk of immediate further injury. The “Righting Reflex” of your visual fields is “Wronging” you after a concussion, leading to 4x greater likelihood of ACL and meniscal tears of the knee. 2-3x risk of Tommy John injuries of the elbow as well. Direct link to concussion and decrease in academic performance. 1 traumatic brain injury decreases the likelihood of going to college by 20%. Most current testing and recovery procedures are insufficient and ambiguous at this time. As a healthcare practitioner, we have found that there is nothing more important than baseline testing. 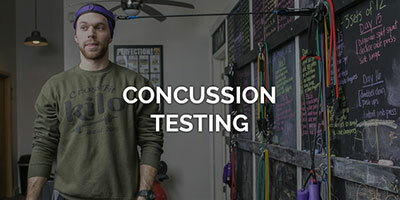 We use and implement the only FDA approved concussion testing. Testing that looks at more than just cognitive function. Follow these tips to manage and address concussion related injuries. Obtain baseline testing before athletic performance begins: comparing yourself to yourself, because there is no normal standard for brain injuries and recovery. Be aware of the dangers of common treatment methods: NSAIDs can increase severity of the injury by increasing blood flow; common medications for headaches have side effects of drowsiness, headaches, cognitive difficulty, speech problems, and vomiting. Diet and nutrition play an important role in the recovery following injury by restoring gut health. Contact us today to schedule your baseline FDA approved testing and have the proper precautions in place before a brain injury occurs.